Our VP, Roy Mantei, ever on the alert for interesting historical pieces, let us know that the Deming Headlight newspaper just published an interesting story about the Northern Luna County’s Deming Airport WWII activities. The story was submitted to the paper’s editor, Bill Armendariz, by Ms. June Loretto, of the Deming Writers’ Group (DWG), which until now, we didn’t know existed. The story got us thinking, and particularly about the theme that the Deming Airport, known during WWII as the Deming Army Air Field. Unlike the article, which might be interpreted to describe the field as a Bomber Pilot and Bombardier Training center, in reality it was, according to our resources and memory, actually used to train only Bombardiers, not pilots. At right, in the blue the circle, is the colorful yet ghostly or spooky appearing cartoon depicting the Army Air Field’s training Shoulder Patch. Notice that the black-robed character is holding a bomb in his left hand. The Headlight story is definitely an interesting insight into Luna County’s long involvement in the history of American Air Power, which we all of course know was actually first launched back in 1916 in the small First Aero Squadron based border town of Columbus, only 30 miles South of Deming with its much later arriving and larger WWII Army Airfield Bombardier training facility. Activated on November 15, 1942, the Deming field conducted Bombardier training for United States Army Air Forces Gulf Coast Training Center (later Central Flying Command). The first class of newly qualified bombardiers graduated on March 6th of that year. In the next three years an estimated 12,000 cadets passed through the Deming Bombardier school. The airplane used at Deming to train the Bombardiers was the Beechcraft AT-11, a fully restored and operational model of which is pictured (courtesy of Airliners.net) immediately below. 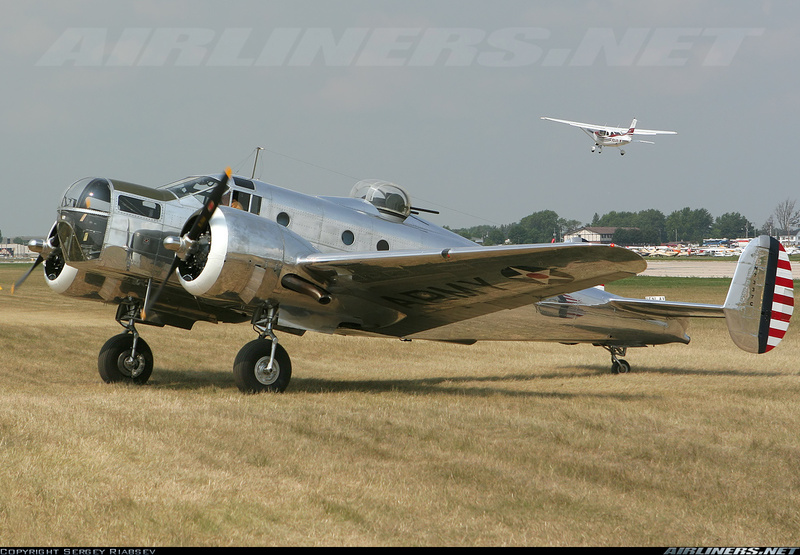 This plane later evolved into the similar looking and highly renowned Beechcraft C-45 Military Executive Transport twin. It’s civilian counterpart, a corporate ship, was called the C-18. Looking above at the plane’s nose, you can see where the young Army cadets practiced and honed their Bombardier skills. It was here, squatting in that nose window, that they learned to use our famously accurate and deadly Norden Bomb Sights. This highly secret bombsight played a major role in helping the U.S. lead the Allies to victory in WWII. Below is a young bombardier posing with his Norden Bombsight. In his training aircraft, the Beech AT-11, he had far less room to lounge about. 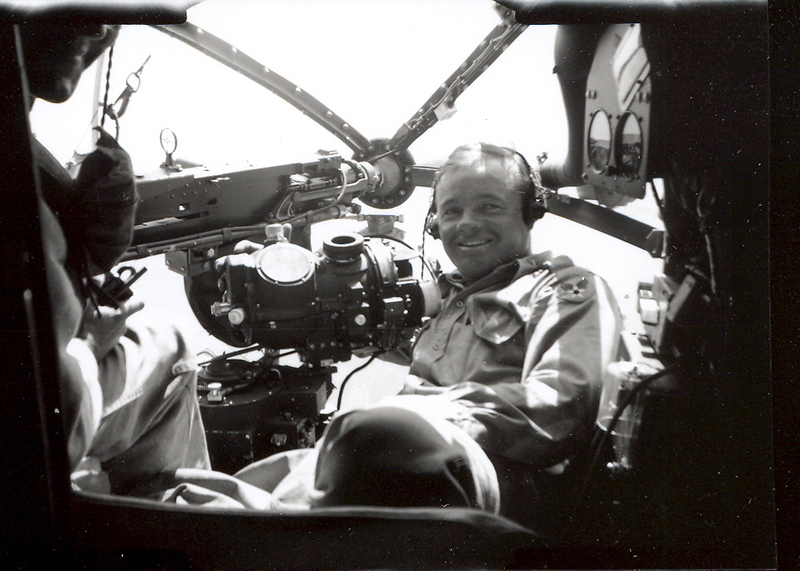 WWII photo of 2nd Lt Everett Glen Hayes posing with his cherished Norden Bombsight in the nose of a B-26 Marauder Medium Bomber. Here, for your historical perusing, is an actual Class Book, “The Blue Ox,” of one of the Field’s graduating groups of Cadets. Just click on the image of the book’s cover below to explore this Class Book’s pages and take a 72 year step back in time. The entire Book has been scanned into PDF format for your convenience. You’ll only need the free Adobe Acrobat or other PDF Reader to enjoy this Class Book’s fascinating pages and historical photos. Without further ado, here’s the Deming Headlight Story about the Deming Airport’s WWII beginnings . 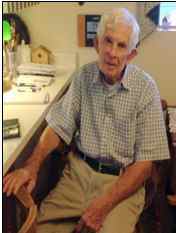 . .
Current photo of former Deming Army Airfield worker, Jack Holmes, who was interviewed for this story. Toward the southern horizon, just behind the Deming Airport runways and on what is now known as Raymond Reed Blvd., stand three World War II-era hangars. The hangars, a red and white water tower and several scattered 1940s-era buildings remain as landmarks where the Deming Army Air Field once filled the acreage from the current Deming Soccer Fields all the way to the Southwestern New Mexico State Fairgrounds. The Deming Army Air Field was a bombardier training unit for cadets from around the country. 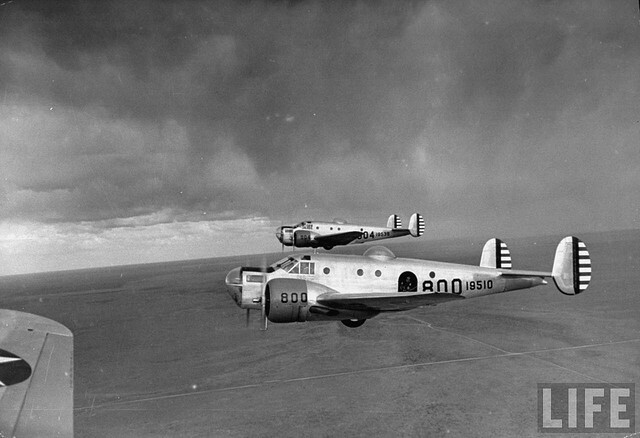 The air field’s main objective was to prepare the cadets to fly (in)* twin engine bombers such as B-25s. The twin-engine, twin-tailed plane they trained on was the A-11 built by Beechcraft (and nicknamed the Kansan (the home state of Beech Aircraft Manufacturing Company). Each class was comprised of 150 to 200 cadets, and after 18 weeks of intensive training, each cadet graduated with Second Lieutenant Bars and received the Spread Eagle to adorn their caps. 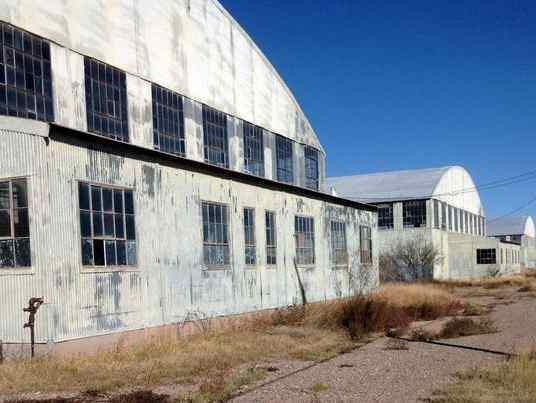 Present day appearance of the over 70 year old Deming Army Air Field Hangars. Although it burned down in 1948, he said a much larger hangar existed just west of the three surviving today. The foundation lies where the hangar once stood. Jack described the size by mentioning that it could hold four B-25s. Included in the cadet bombardier’s training was an exercise to skip bombs along the desert floor like stones skip over a pond. Holmes recalled a training exercise where 100-pound bombs were used. They held five or ten pounds of black powder to ninety or so of sand. In one of the bombing exercises, one pilot followed too close behind another pilot at the bombing range. As the following pilot took his turn and took his bombing dive, the previous pilot’s bomb’s detonation blew out the bottom of his plane and blew a hole clear threw one of his wings. Fortunately, the pilot was not injured and managed to fly the wrecked aircraft back to the base. Repairs were finished and the plane was tested to insure that its landing gear and flaps could open and close, according to Holmes. After passing a vigorous examination, the plane returned to service. To everyone’s shock, the same plane came back to the hangar within a day or two with the same damage. Once the allies secured a victory in Europe (V-E Day), May 8, 1945, a reassignment of P-38s from Europe to the Pacific theater took place. The Deming Army Air Field stripped the camouflage paint from the aircraft as a means to shield them from detection as they flew toward their targets over the waters of the Pacific. One evening, about 25 planes took off heading west for a night bombing exercise. As all the planes flew off into the distance, Holmes said he saw a sky full of red navigation lights. “What a sight, he said. How many of us will ever see something as thrilling? Holmes‘ memories remind us of the generation that witnessed the Day of Infamy, December 7, 1941. Stories from men in their late 90s who participated during the war years still circulate, but soon all those first-hand memories will be silent. The hangars rising out of the desert landscape are a symbol of a group of gallant men who flew into the face of war from the Deming Army Airfield. “By The Way…” columns are written by members of the Deming Writers Group (DWG). This parenthetical insertion by us of the preposition “in” is necessary, because, without it, the sentence can easily infer that the cadets are learning to fly the airplanes, rather than ride in them in order to solely perform the responsibilities of bombardiers. We have a C-45 at the CAF-AZ Airbase at Falcon Field in Mesa, AZ, but it is not in the AT-11 configuration. However if you are ever in Tucson, The Pima Air Museum has a beautifully restored Kansan. In the middle 50’s, My Mother and 2 more ladies from Columbus carpooled to Deming where they worked at a plant that manufactured military ammunition out near the airport. My Mother was Quality control, and had to verify the exacting tolerances of 20-mm shells. Can some of the old-old timers tell me more about this subject? Thanks for the input, Frank. Interesting item, eh? And fact that your Mom used to commute to the munitions ops in Deming is also interesting. Is she still alive?